The good news? Countries are saving more lives than ever before, especially when it comes to kids under 5 years old. The bad news? Obesity-related diseases are some of the top causes of death worldwide, and researchers are worried about what the future holds. 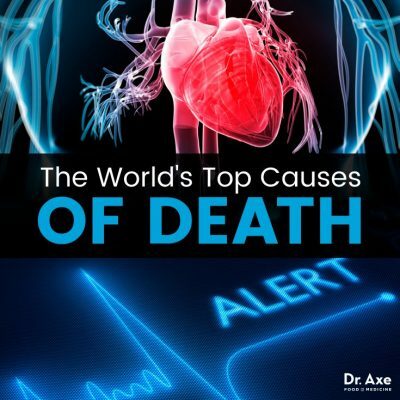 What Are the Leading Causes of Death in the World? The GBD is the largest, most comprehensive effort to quantify health and deaths across the world and how it changes over time. More than 2,500 collaborators from over 130 countries and territories were involved in this year’s report, which examines 2016. Some of the news is really positive. For example, the data shows that death rates from some of the world’s malicious diseases, including HIV/AIDS, malaria, lower respiratory infections, neonatal preterm birth and diarrhea, all declined by at least 30 percent in the last 10 years. But it’s the first in the “triad of troubles” — obesity, conflict and mental illness — that researchers believe is especially dangerous and keeping people from living long and healthy lives. Already, the top cause of death worldwide in 2016, accounting for almost 9.5 million, was ischemic heart disease. This is also known as coronary artery disease, a condition occurring when your arteries are damaged and blood, oxygen and nutrients can’t flow through to the heart. Plaque in the arteries and inflammation are usually to blame for the damage and, if the lack of access to the heart continues, can lead to a heart attack. The authors of the GBD are alarmed at how quickly the rate of obesity is increasing and how the disease’s effects are spread throughout all sociodemographic levels ­— no one is safe. Currently, a too-high body mass index is the fourth largest contributor to the loss of healthy life, following high blood pressure, smoking and high blood sugar. Additionally, poor diet was linked to almost one in five deaths globally. So what do we do? Luckily, it’s not all doom and gloom when it comes to the report. Obesity is the main concern, but most people can address the condition naturally and it’s well worth it. You’ll reduce your risk of dying from an obesity-related disease, like heart disease or diabetes, and enjoy overall better health. So how can you obesity, one of the top causes of death worldwide? 1. Eat more healthy fats. People who want to lose weight often avoid fats, which is a grave mistake. Not only do healthy fats help you feel more satiated, they’re full of nutrients that our bodies need. Of course, the keyword here is healthy. Foods like avocados, grass-fed butter, coconut oil, extra virgin olive oil and those rich in omega-3 fatty acids, like wild-caught salmon, can help you lose weight and reduce bad cholesterol levels. And when it comes to other foods, choosing a small amount of the full-fat, unprocessed food is always a better option than a product that’s been pumped with preservatives and artificial flavor to mask a fake taste. 2. Try a low-carb, high fat diet. Speaking of fats, if you’re serious about weight loss, you might want to consider a low-carb, high fat diet. This way of eating is proven to offer greater protection against cardiovascular diseases and mortality. People on low-fat diets are often eating foods that are higher in sugar and refined grains. Eating a high percentage of fats, as you do in the ketogenic diet, can help you feel full for longer. It also helps the body absorb vitamins better and get help balance hormones. Plus, high-fat foods are pretty darn tasty! 3. Eliminate sugar and processed foods. I probably sound like a broken record, but refined sugar in all its sneaky forms and processed foods are some of your body’s biggest enemies. Sugar destroys your health by making you fatter, increasing your risk of cardiovascular disease and type-2 diabetes, promoting leaky gut, increasing your risk of certain cancers and increasing inflammation. And hidden sugar is in quite a few things — it’s hiding in foods like granola bars, low-calorie drinks, flavored yogurts, condiments and restaurant foods. Eliminating processed foods automatically gets rid of many of those unexpected sugar sources and will help you avoid one of the top causes of death. 4. Add more high-fiber foods. You’ll find packaged foods enriched with fiber all the time, but it’s better to get them from natural sources whenever possible. These foods contribute to healthy digestion, regular bowel movements and manages blood sugar levels. Some of my favorite high-fiber foods include avocados, berries, peas, acorn squash, black beans and nuts. Get moving. While improving your diet is the main thing you want to focus on, as your energy increases, adding exercise is one of the best things you can to lose weight and improve your overall health. From different styles of yoga to swimming, short HIIT workouts to long walks, find the type of movement that suits you best and get going! Discuss bariatric surgery with your doctor. For some people, no amount of diet changes gets them to a healthier weight. In that case, you might want to discuss bariatric surgery options with your doctor. The procedures have a lot of different pros and cons and, depending on your health, might be an option to help you lose weight and minimize your risk of one of the leading causes of death. Think about heart disease testing. If there’s a history of heart disease in your family or you’re concerned about your weight and its effect on your ticker, these heart disease tests could help your doctor better predict heart trouble. Add in natural fat burners. Dodgy-sounding supplements like garcinia cambogia are often marketed to people trying to lose weight, but these are usually terrible for your health. Instead, try adding natural fat burners to your diet. Green tea, probiotic-rich foods like kefir and sauerkraut and foods like hot peppers and bone broth can all help you reduce hunger and stimulate weight loss. Though I’ve focused on obesity, conflict and mental illness are also concerning researchers. While most of us are insanely lucky and will not experience the traumatic conflict referred to in the GBD, mental illness strikes indiscriminately. There are many factors that lead to depression, from genetics and traumatic experiences to substance abuse and neurotransmitter imbalances. If you’re wondering whether you’re having a tough time or are clinically depressed, these 12 signs of depression is a good place to start. If you are depressed, incorporating these natural remedies for depression, like certain supplements and lifestyle modifications, can help ease symptoms. Essential oils can also help balance hormones and lift your mood. In fact, I recommend oils like lavender, bergamot and ylang ylang to anyone who could use a little pick-me-up. Though obesity is one of the top causes of death worldwide, we definitely want to address our mental health, too. The GBD, one of the most comprehensive reports on global health, has identified obesity as one of the most top causes of death in the world. They’re especially alarmed at how quickly obesity and related diseases are rising in the world among every demographic. Already, heart disease is the leading cause of death worldwide. Reducing your risk of obesity is one of the best things you can do for your health. This includes changing your diet, adding exercise to your routine and considering heart disease testing. Mental health is a concern of the GBD as well. If you’re struggling with depression or another mental illness, you should see your doctor.